Looking for ways to spend less money? Me, too! Sometimes, even your best researched plans can go awry, meaning more dollars in the expenses column and less in the revenue column. You could look at finding new ways of generating extra income but sometimes that’s just not an option. That means finding some quick and easy ways to cut spending while working on getting the numbers in the revenue column looking a little (or a lot) healthier. Or, maybe, you’ve wandered off the frugal living path and just need a few quick and easy ways to get back into your usual frugal habits. When money is tight and you’re looking for ways to reduce your spending without going on a complete spending freeze, you’ll find these five areas of spending are usually the easiest to control. Here are the top 5 ways to cut spending that I always look to first when the budget is a little out of whack. I love books. I have several bookshelves groaning under the weight of hundreds of books, hardcover and paperback, that I’ve collected over the years. I also have a substantial DVD collection. It’s hard to look at all those titles stacked up (not quite so neatly) on the shelves and not speculate as to the total purchase price of my collection. When I first decided to pursue a frugal lifestyle, my collecting of books, magazine, etc. stopped (sorry Book Depository). I now only purchase books to add to my collection after I’ve borrowed them from the library, and I know that I love and will read again and again. Don’t despair! No longer buying books and magazines doesn’t mean you need to miss out on reading your favourite magazine or the latest title from your favourite author. You can join your local library and enjoy those things for free! Libraries are great places for all sorts of free services so make the switch from expensive collecting to free entertainment. The one area of spending I can lose track of very quickly, especially when I’m stressed or busy, is grocery spending. There are two simple ways of saving money on groceries, actually, there are three if you include eating less – not my favourite option! One of those options is eating from the dollar menu at your favourite fast food joint but, that’s not really what being frugal is about. It might save you money up front, but long term your health and therefore your wallet will suffer. Instead, try using simple ingredients and make your meals from scratch. Cooking is not an exact science but at least you can still eat your failures – usually. Start simple. Simple cheap ingredients like fruit and vegetables in season, cheap cuts of meat or dried beans for protein plus home made bread or plain rice can provide quite a range of tasty meals. Put Pinterest to work and search for ‘frugal meals’. You’re bound to get lots of options. Before adopting a frugal lifestyle, I used to wander around the shops while I was on my lunch break at work. I don’t think I ever had a spending problem as such but, I would invariably find something I needed while on these wanders. Sometimes it was a book or magazine (see above :-)), sometimes it was an item of clothing, usually it was something I could very easily live without. When I chose to become more frugal in my spending habits, taking a walk through the shopping area at lunchtime was the first thing I stopped doing. You’d be surprised how little it changed my life when my crazy patterned sock collection stopped growing. And, eliminating that impulse spending made a big difference to my budget. If you suspect you’re buying stuff “just because…” then staying out of the mall, and therefore away from temptation, is a guaranteed way to make sure you spend less every week. Despite the rise and fall of oil prices, the price of fuel never seems to change that much. Staying out of your car is the best way to lower your fuel costs. The less you drive, the less you spend on fuel. Driving less doesn’t mean walking everywhere, although that wouldn’t be a bad thing, but it does mean making some conscious decisions about when and where you drive. Roll up as many errands as possible into one trip. Car pool to work if you can. Catch public transport if it’s available. Sometimes, an unplanned trip to my regional hub is unavoidable but generally, if I’m making the trip, I know ahead of time and I make a plan to include every other task I can think of so I can avoid another trip in the near future. Next time you’re about to grab the keys, ask yourself if you really need to make the trip and if you do, are there other errands you can take care of at the same time? The television is a huge time sucker. Not only does it consume vast quantities of our time, time we could be spending on something productive (or a side hustle), but it also parades a never ending stream of wants before our eyes. The benefits of turning off the television are twofold. You spend less by not being exposed to a world of new stuff plus, you can engage in some of the activities that will help you spend less on the stuff you do need, like food. Spend less time on the couch and more time in the kitchen and not only will your wallet benefit but chances are your health will, too. It is possible to reign in your spending and still enjoy those things you love most. You can read the latest books and magazines. You can eat delicious healthy food and you can use your time wisely by learning new skills rather than watching the television for hours on end. All gain and no pain! These are my top five ways to spend less money. 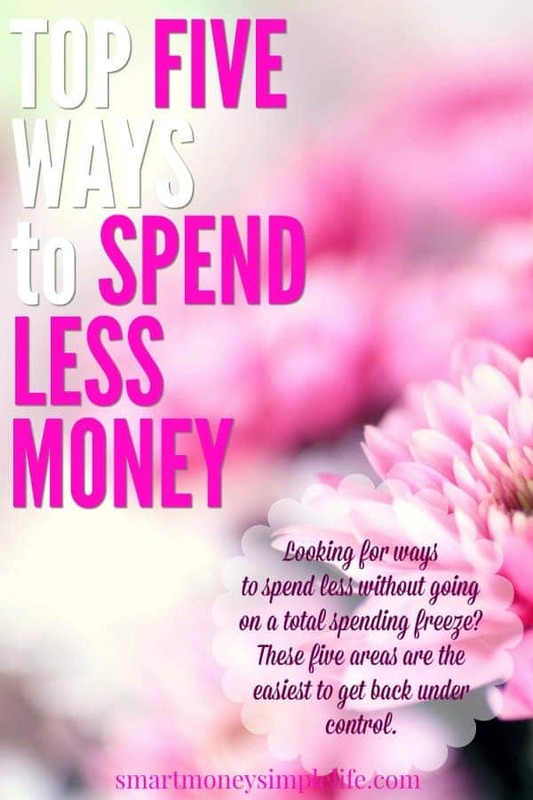 What are your top five ways to spend less money? Are they different? Why not share them with us in the comments? Disclosure: This post contains affiliate links. If you choose to make a purchase via an affiliate link Smart Money, Simple Life receives a small commission on the sale which helps pay the blog’s bills. Thank you.